Soldiers stumbling across the grave of a soldier – in an almost poignant yet poetic twist, British veterans of Afghanistan came across one of their ‘predecessors’ in the form of a Saxon warrior hailing from the 6th century. And to add a dash of romanticism to this fascinating scope, the discovery was only made on the last day of the excavation centered on the military training lands on Salisbury Plain. The archaeological project, mainly focused on the site of Barrow Clump, was carried out as a part of a conscientious initiative known as the Operation Nightingale. The endeavor aims to provide constructive recovery for the injured soldiers who served in Afghanistan by involving them in the field of archaeology. On a positive note, the enterprise, made in collaboration with Wessex Archaeology, has been successful, with many of the veteran soldiers making their mark as retained archaeologists. As for the incredible discovery itself, the skeletal remains of the 6th century Saxon warrior was accompanied by his well-preserved possessions, including – a knife, tweezers, and a belt buckle showcasing exquisite craftsmanship. But arguably, the most important find in terms of rarity pertained to his intact pattern-welded sword that still clung on to the remnants of a wood and leather scabbard. All of these finds are somewhat surprising by virtue of their preserved nature, especially considering that the 1,400-year-old grave itself lay beneath the ground reserved for tanks and other imposing military vehicles. It was a classic last day of the dig find – there was such a buzz across the site, the soldiers definitely had a sense of kinship. I have to admit I also thought ‘there goes my budget’ – there was quite a tricky conversation afterward with the MoD because of the sudden increase in conservation costs. 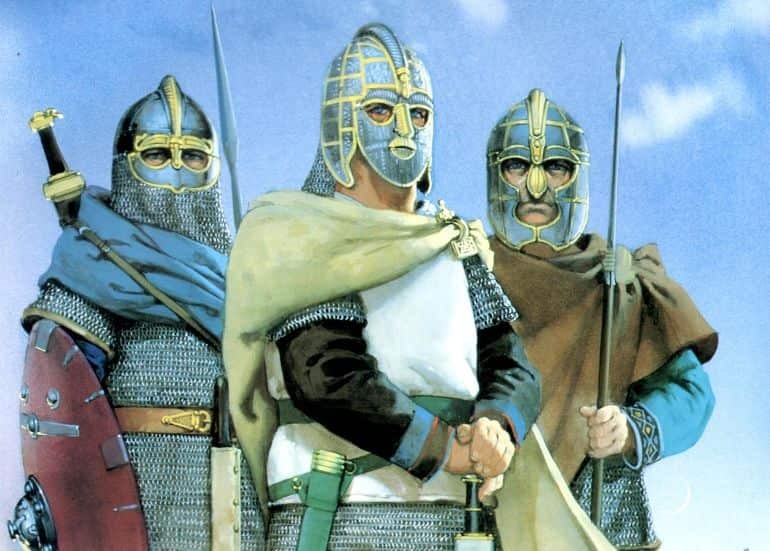 Representation of rich Anglo-Saxon warriors from circa 6th century AD. Illustration by Angus McBride. 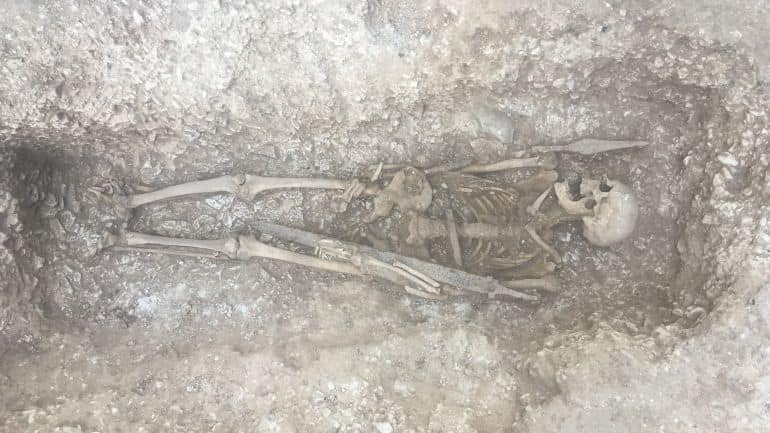 Now while the rich (well preserved) remains of the Saxon warrior possibly pertained to the most significant discovery made during this excavation, the three-week project also revealed its fair share of related archaeological objects. To that end, the Barrow Clump site is already known for its Neolithic heritage and Bronze Age burial mound, later taken over by the Anglo-Saxon cemetery complex. Entailing the latter, the soldier-archaeologists were able to unearth a range of Saxon graves near the burial mound, with the pattern generally involving women and children graves in the center and graves of men along the edge of the perimeter. Furthermore, the researchers were also able to get hold of various jewelry items and weapons, including a large amber bead buried with a little girl and a less well-preserved sword from another warrior burial. Lastly, the archaeologists have hypothesized that most of these deceased originally hailed from an Anglo-Saxon settlement situated a lower elevation, thus suggesting how this culture symbolically perceived higher grounds as being sacred and closer to their ancestors. As for these numerous finds, including the fortuitously-identified Saxon warrior sword, most of them will be studied further and then conserved by the specialists at Wessex Archaeology. Eventually, the discoveries are planned to be exhibited at the Wiltshire Museum in Devizes.